I'm probably not alone in saying that this week's world events changed my prayer life and showed me even more the importance of being thankful each and every day. "Relent, LORD! How long will it be? that we may sing for joy and be glad all of our days." 108. Bridget's smiling face popping up over the side of my bed to ask, "Do you want to snuggle with me?" 119. More daylight each and every day...love the longer days! 127. Three joyful kids, dressed in pj's and robes tumbling down the stairs to ask if they could maybe, just maybe watch Toy Story 3. 128. Jonah loaning Bridget his slippers, leaving himself with none-just because she was sad to not have any. 129. Henry's excitement at realizing Blake was home in the middle of the day...gotta love Spring Break! 132. Watching the kids play near the edge of the water and eventually stepping in and getting wet-muddy-filthy-happy. 138. Sam put up a soccer goal in the backyard...so fun! 139. Hilarious, belly-laughing moments at the dinner table (Bridget, "He sat on the car! HAHAHA!") that aren't even really funny, but they are moments we will treasure forever. 140. Leaning over to tell Sam, "We should see that movie Bryan mentioned in church today" only to have Beth lean over from the other side a few minutes later to say, "Have you ever seen that movie? I have it if you want to borrow it!" 144. Henry's Lego magazine finally arrived! 145. Our first tulip bloomed...and we weren't even sure they would come up this year! This year was Mary Beth's 70th birthday, and we appreciate her so very much! Mary Beth has been a blessing to so many, and we all feel so honored to be able to learn from her and share life with her. The family worked together to create a fun-filled birthday weekend to celebrate with her. Friday evening, we (all of her adult children and spouses that live nearby) got babysitters for our kids and took Mary Beth out to Red Lobster. It was an evening of much laughter! That night we gave her a big gift...her surprise Saturday with the girls. I had arranged for her to babysit for my kids all day Saturday (to insure that she wouldn't make other plans! ), but I was really planning a fun girls day out. We started the morning with a breakfast of cinnamon rolls, fresh fruit, and coffee at my house. From there we met up with Kelly and Beth and headed to the nail salon for a manicure and pedicure. It was a treat and Mary Beth thoroughly enjoyed her first ever manicure. From there we headed into Dallas, where we met up with Amy and enjoyed a lovely tea-type lunch at a girly restaurant called The Chocolate Angel. The food was very good but the service was TERRIBLE. I had found the place online, but will not go there or recommend it to anyone because of the very poor and extremely slow customer service. We really did have a good time anyway...it's hard not to have fun with a group of girls like this! By the time we were done shopping we were all pretty worn out! We still had a drive ahead of us, so we turned toward home. On the way home we stopped for a quick meal at Wendy's/Chick-fil-A. On Sunday, we all went to our own churches and then headed out to Mary Beth's house, bringing a lunch feast of home-cooked Mexican food with us. We spent the rest of the day hanging out with her and listening to her words of wisdom gathered over the last 70 years of life. One day this week, Henry found himself in trouble for a minor little issue. I sent him to his room to think about what happened, and he was to come back out when he was ready to talk about it and had a better attitude. Jonah was greatly distressed at having Henry stuck in his room. For this very social child, there could be no worse punishment. (Of course he doesn't realize that Henry actually appreciates time alone now and again!) 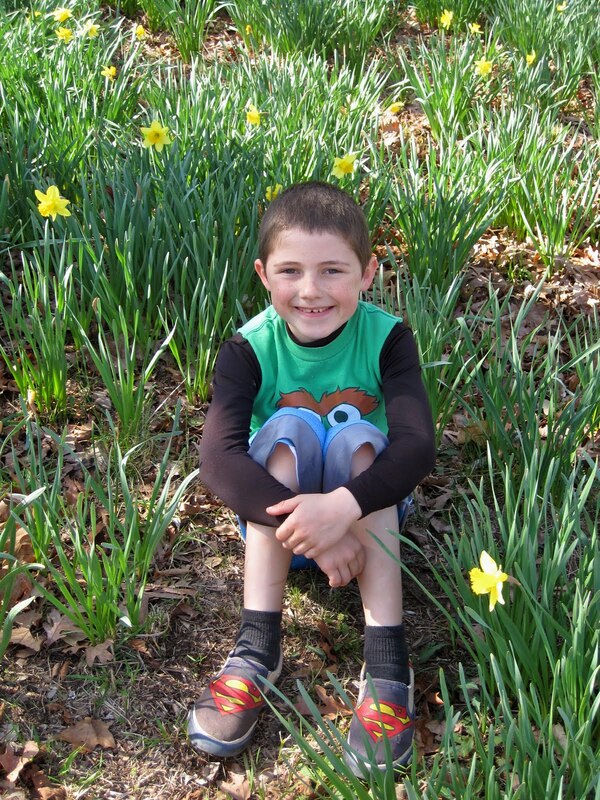 Less than ten minutes after Henry was sent away, Jonah came to me to plead Henry's case. His brilliant idea to 'free' Henry from the miserable punishment that I had bestowed on him was this: "I'll go up to Henry's room and take his place, so that he can come out and play!" It's springtime in East Texas! 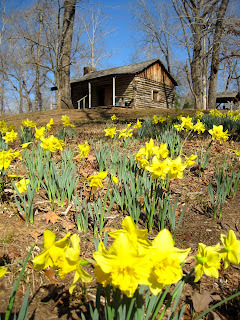 Which means the daffodils are blooming at one of our favorite places...the daffodil fields. About 45 minutes from where we live, this place is a treasure that the kids and I look forward to enjoying every year. Once again, it didn't disappoint. The bright, beautiful blossoms positively glow when the sun shines on them...and they go on and on for acres. Such beauty! My friend Beth was able to join us for a relaxing afternoon picnic. It was lovely, even though it was a little bit breezy and on the cooler side of comfortable. 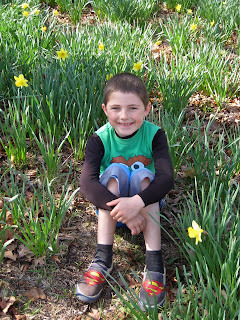 Lest you think the daffodil garden is all about flowers, let me set you straight. There is also a lake with a path going around (and over) it. The kids enjoyed fishing some kind of greenish, mucky substance out of the water and bringing it to us. For one horrifying, brief moment I thought Bridget might actually eat it after we said it looked like Jell-o. I think hope she was only teasing us. There is also a replica of a pioneer cabin on the property. It's set up inside with a kitchen area, tools and beds and is very interesting to walk through and inspect. The kids have enjoyed this part even more since reading the Little House books! It's so fun to see history come alive for them. Thanks be to God for his indescribable gift! 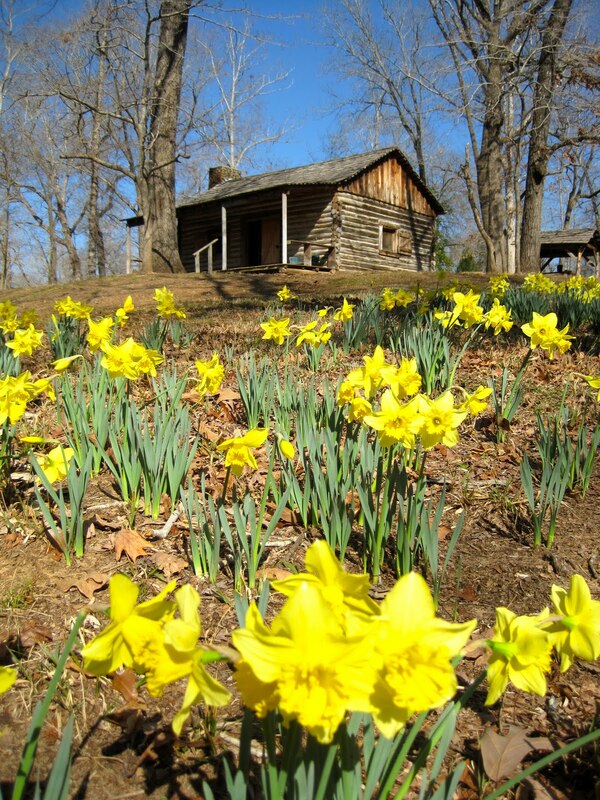 I love the transition from winter to springtime, beginning with subtle little signs and quickly progressing to amazing shows of glory like the daffodil fields.